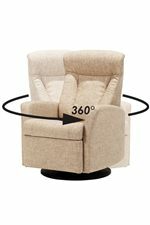 Designed with IMG technology for amazing comfort and function, this lift chair is everything you've ever wanted from your favorite seat in the house. The piece is multi-functioning, with a dual motor to to help you easily and safely operate the lift function. 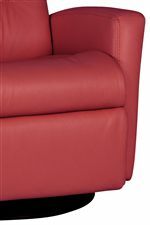 Fully reclining with an integrated footrest and adjustable headrest, the chair offers ultimate relaxation. Track arms and channel tufting create a modern appearance that looks comfortable and sophisticated. 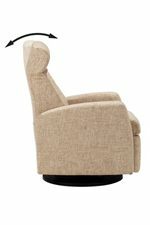 The Divani Large Multi-Function Dual Motor Lift Chair with Track Arms by IMG Norway at Malouf Furniture Co. in the Foley, Mobile, Fairhope, Daphne, and Gulf Shores, AL area. Product availability may vary. Contact us for the most current availability on this product. Recliner Mechanism Effortless reclining and adjustable back rest angle. Integrated footrest. The footrest can easily be unfolded by using the handle. 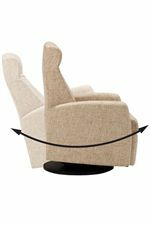 To fold it in you should use your feet to press the footrest down towards the chair and move your body weight forward while seating. Primetime television watching sessions; Saturday afternoon gatherings of friends and family; kids kicking up their feet with a computer tablet; easing back into a good book. No matter how you choose to relax and rejuvenate, the Divani collection is here for you and built to last. 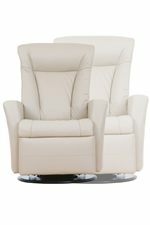 Crafted using sustainable materials such as eco-friendly wood and raw materials, layered with cold-cure molded foam that allows for body-friendly curvatures, and made to move in all different direction, the Divani recliners are made to withstand wear-and-tear of daily life while keeping you completely comfortable. 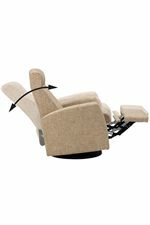 Glide, recline, swivel, adjust the headrest, and utilize the footrest. No matter how you choose to situate yourself, the Divani recliners help you sit ergonomically so that your blood supply begins to circulate more freely and your back muscles relax as your spine is gentry supported in the right place and on the correct angle, true story. The space-efficient and feature-rich design is sure to keep your seating area as eye-catching as it is sure to keep you completely comfortable. Effortlessly outfit your home with beauty and relaxation when you bring the Divani collection from the Relaxer program into your home. The Divani collection is a great option if you are looking for Contemporary furniture in the Foley, Mobile, Fairhope, Daphne, and Gulf Shores, AL area. Browse other items in the Divani collection from Malouf Furniture Co. in the Foley, Mobile, Fairhope, Daphne, and Gulf Shores, AL area.